I had forgotten about this painting hiding in my portfolio from the past. Four years ago, a friend of mine and I would paint outdoors in the country on our days off . On the day I began this, my friend was suffering with allergies and we had to leave the scene prematurely. 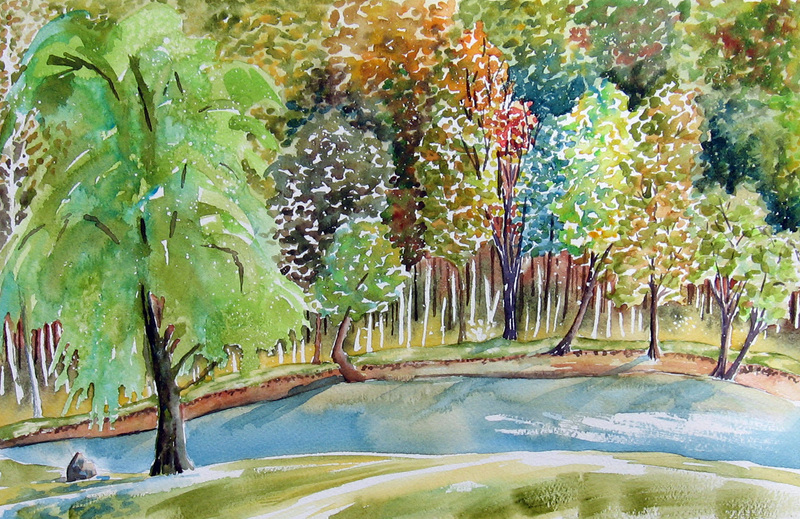 I had my drawing of the tree trunks and the creek and the far side completed and that was it. It was obvious that this was a fishing spot as the ground was flattened out and there was a path leading to it from the road. I painted the scene from memory and added the boy and his dog. I think this was the first painting that I began texturing leaves and trees like I do today. 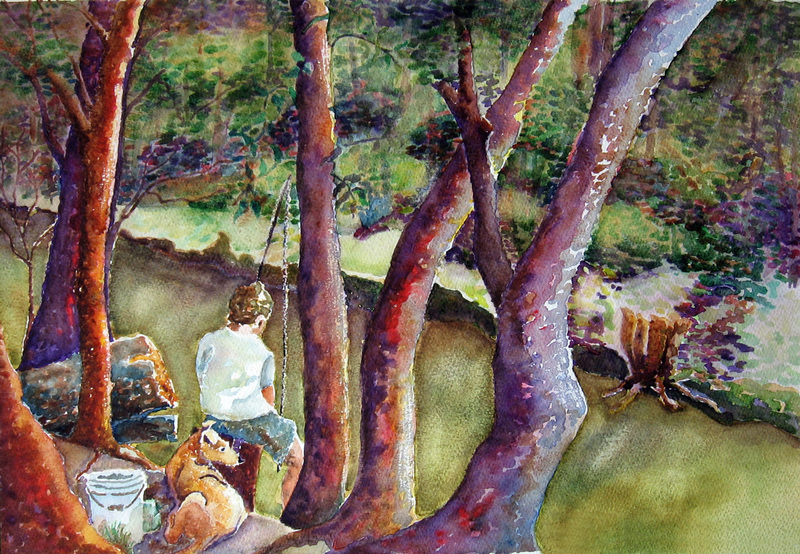 I also used a white crayon for wax resist on the fishing line and sandpapered the surface of the water in the creek. This is a close up version of a scene I painted in July, here. This one was completed in one sitting while the other was one I started on site and finished at home. The wind was whipping and the sun was shining brightly. Light flickered off one area of the pond that seemed to catch the wind. The foreground tree would change from silvery to light green everytime the wind chose to gust and toss the branches. Not only did the leaves flicker on the trees on the far shore but it filtered down through gaps and lit the trunks that were of a lighter color. All I could assume was the loss of leaves on some of the trees created larger gaps in the foliage and allowed for the light to filter through the canopy. The hawk was there once again. This time he circled and dipped very near me several times. No. It was not in a menacing way. He came so close, twice, that I witnessed the slight change to tail feathers that helped him to maneuver and turn. I had never seen that before. I am following Heather on her blog. She is studying drawing and has been practicing value studies and making marks to describe form. This runs hand-in-hand with what my students started last week. I decided to take a black and white photo of clouds (thank-you Wet Canvas!) and practice some mark making of my own. I introduced my class to the marks made by Degas, Van Gogh, Seurat and a few others that are found in the pages of Bert Dodson’s Keys to Drawing book. We spoke about how we needed to try and find the mark making that best suited us. I decided to try some mark-making of my own. In this study, I used the sides of my pencils. This was the quickest method to get these shapes and values down. In the past, this is what I see my students doing. Makes me wonder if other forms of mark making are too tedious and confusing for them in the beginning. My other thought was that this form of shading comes in handy for a thumbnail sketch, done quickly, for a larger finished drawing or painting. This way was, by far, the most fun for me. 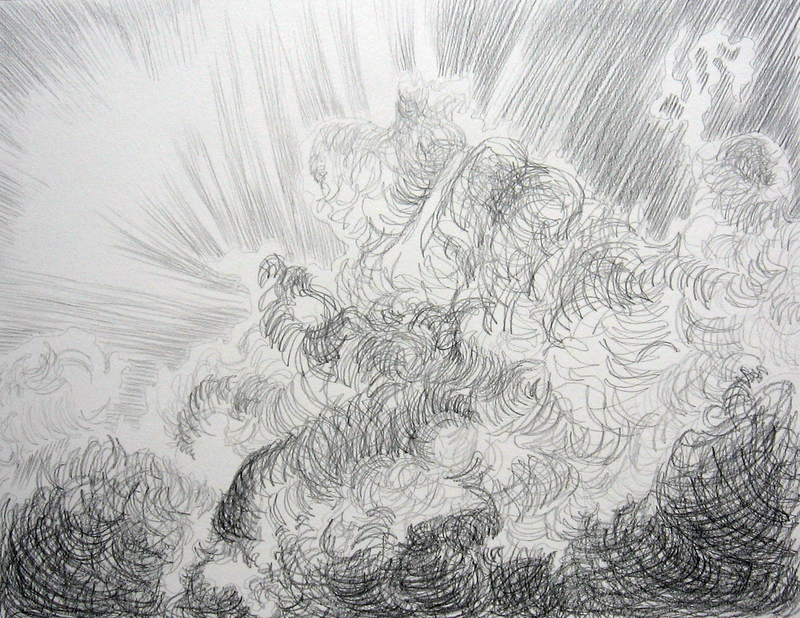 I tried to imagine the form of the clouds I was seeing and attempted to emulate their contours and gesture by allowing the point of my pencil to scroll over and around them. 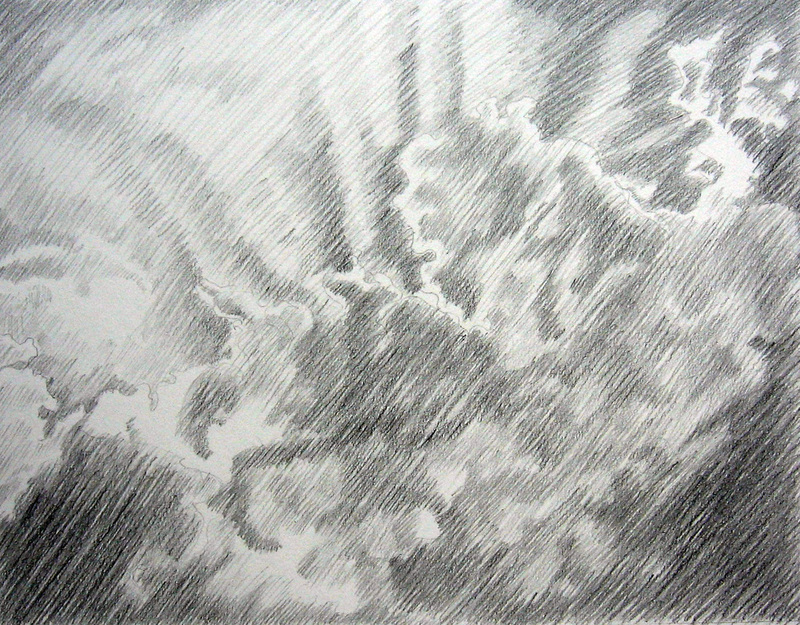 I like the feeling of roiling clouds that I was able to capture with this mark making. Note I made my strokes over the sky flat. I saw no form in that and made my marks to reflect that. In this attempt, I used crosshatching and incorporated curved lines laying next to each other as well as layers of lines going the other way to build up the layers of midtones and darks. This took longer than the contour/gesture study but was shorter than the lines laid next to each other study. 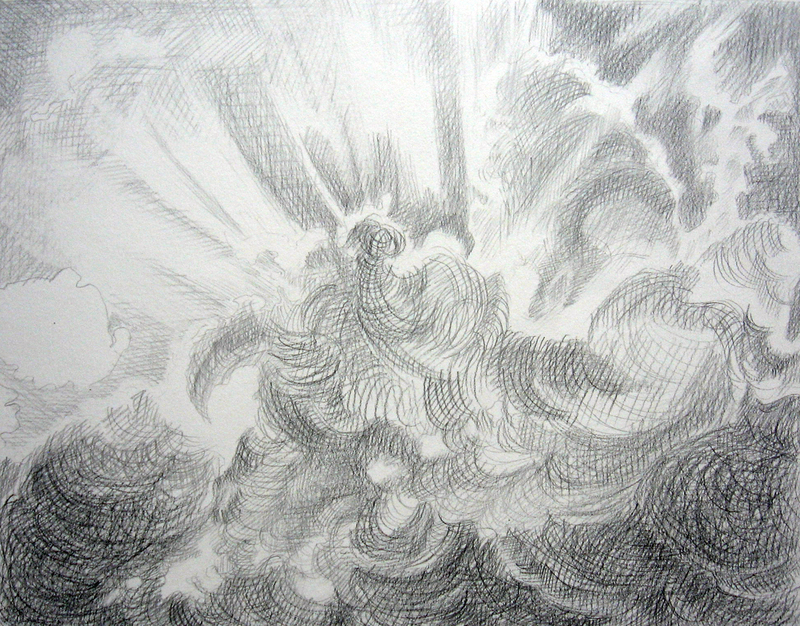 I like this study because it incorporates the contours as well as gives furthur definition to the cloud forms and allows me to achieve better values in the sky. 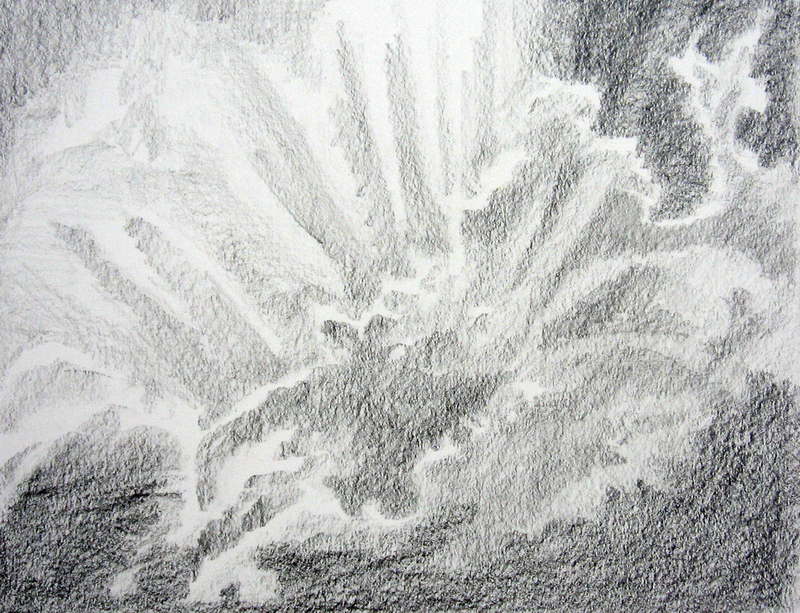 I used a gum eraser to lightly touch up some areas around the rays and to soften some areas within the clouds. 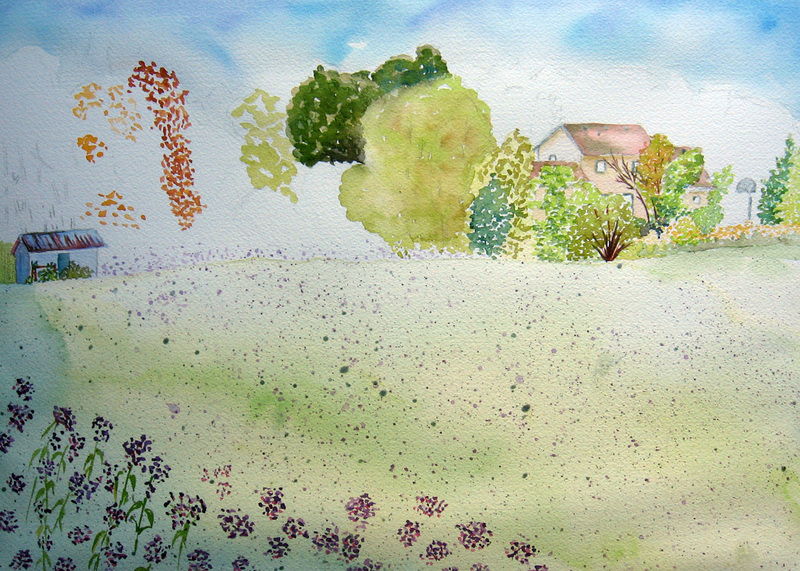 Indiana Meadow: Finally A Plein Air!!!!! Finally!!!! I painted this totally outdoors. 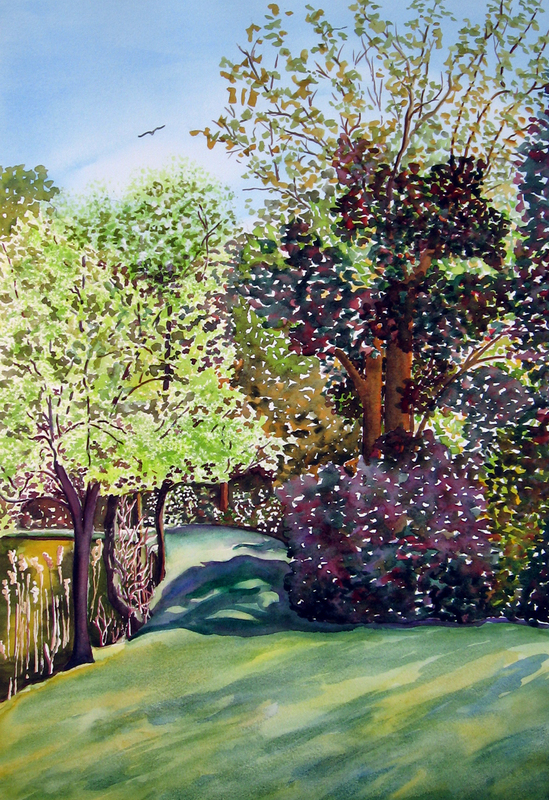 It is a scene to the west of the property where I have been painting, outdoors. I have followed Stephen, Frank, Keith, and Chris (all who paint beautiful watercolors outdoors) for quite some time, now. They initially inspired me to keep trying this outdoor approach. I can honestly say I completed this outdoors. It took me two visits, however. I am so slow. I have been watching this meadow change over the summer. I was immediately drawn to the wildness of it. Six weeks ago it was covered in Queen Anne’s Lace and I wish, now, I had captured that. When I came out Labor Day, I had to try and paint the scene due to the fact that it dazzled with a pinkish-purple flower. I have since spent time on the internet and found that the flower is called Ironweed. Al would be so pleased. His postings have taught me to be more observant when I spend time outdoors. There were butterflies and hummingbirds feasting off these flowers and the whole field seemed to dazzle with light and activity. A deer even ran through while I was sitting there. Yes, my friend the hawk was circling once again. 🙂 The tree line was beginning to throw off warm casts of color and one large tree poked up all spindly having already dropped most of its topmost leaves. The first step was to lightly pencil in the treeline and two buildings ( had to include the basketball backboard as it is VERY Indiana). 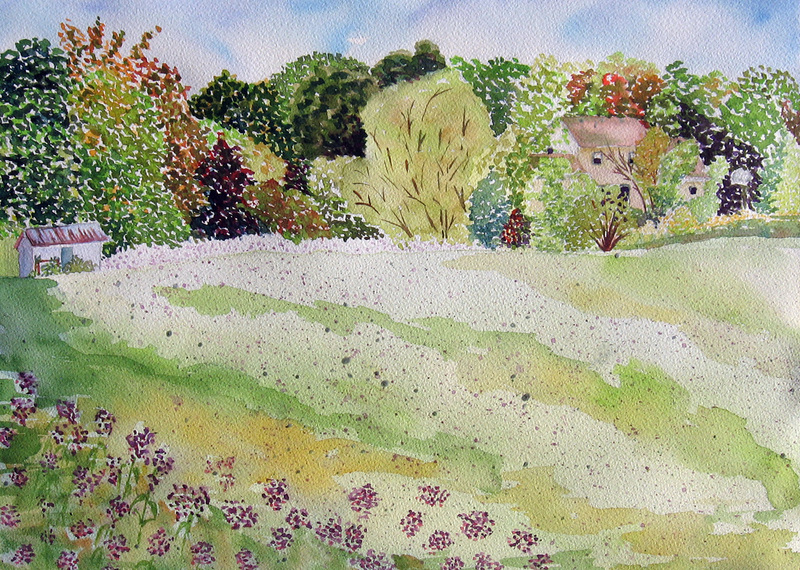 I splattered some frisket for texture as well as to include white dots for the few remaining Queen Anne’s Lace. I then applied light washes of color to the meadow area to define the shadowed area and the part that sat in bright sunlight. I defined the buildings wet-in wet and dotted in the golden rod I saw on the far northern edge leading out from the house. 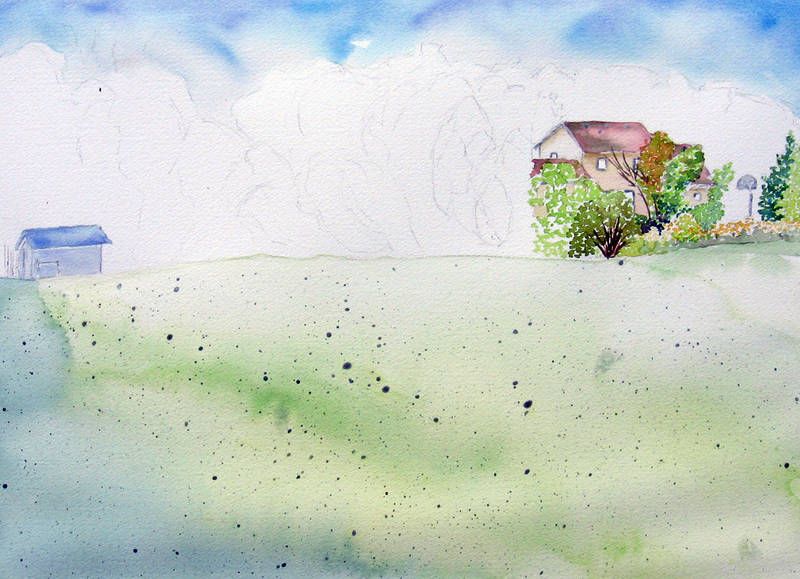 Continued on to the left with the treeline attempting to get the shapes and color down. I also decided to define the Ironweed in the foreground in the hopes that it would assist with depth. This was what I had done on the first day I worked this painting. When I returned, I knew I had to define the foreground meadow a little more so I tried to read the strips of yellow and green that I saw running through it. I splattered more of the purple-pink colors of the Ironweed and deepened the shadows. I completed the treeline. At this point I sat and examined the painting at a distance. I decided I was not satisfied with how it read. I sat back down and stared at the treeline. The speckly white took away from the deep dark of the treeline that turned the meadow lights on so I scumbled water through the colors that were all ready there. This helped to deepen the shadows on them that I had observed. 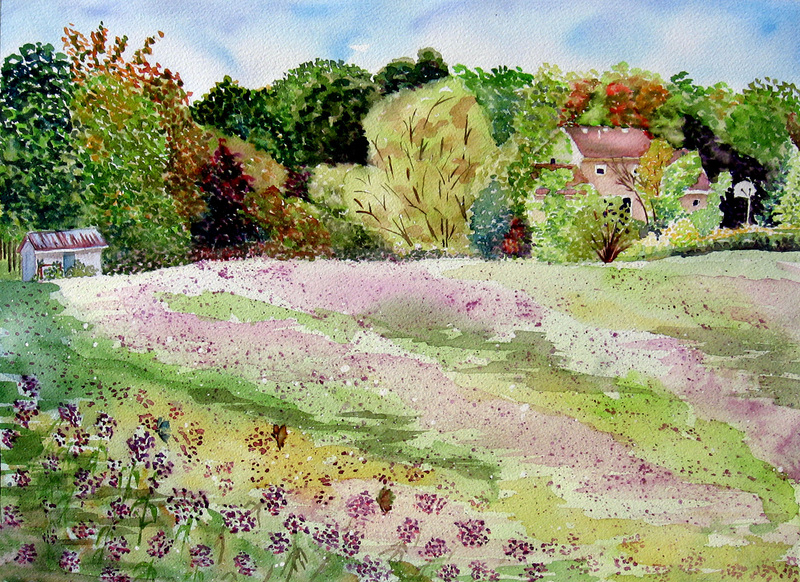 The meadow had streaks of a pinkish cast throughout that followed the original patterns of the greens and yellows I had washed in earlier so I streaked those in very wet. I was careful to leave the bright light I saw leading from in front of the shed and partway down the back of the meadow. As a final touch, I added some of the butterflies I had seen while sitting there. Back to my new hideaway for a day! The scenery, here, is still the same if you just glance at it. Quite different if you sit down and take it all in. The trees and the grass and the noises are all changing. There is not that summer buzz. I never noticed that before except when winter comes and all is so silent. There aren’t as many birds. The air smells different. The shadows seem longer. I am learning that the changes leading to fall and winter start ever so subtly. Thank-you, Al. No one was around the afternoon I started this painting. There was a little wind and I could hear the rustling of the leaves in the woods. There was a hawk that circled and left and came back to circle again. The one hawk and the quiet made it feel like I was encased in a world of my own like a dream. This is the view of the west edge of the pond and the entry to the bank that creates a long walkway between the towering trees of the woods and the pond. I just had to include the hawk. I was struck by the dark greens lower in the foliage to the burnt yellows of the topmost branches. The early loss of leaves on some of the trees, no doubt due to the long dry spell we had. 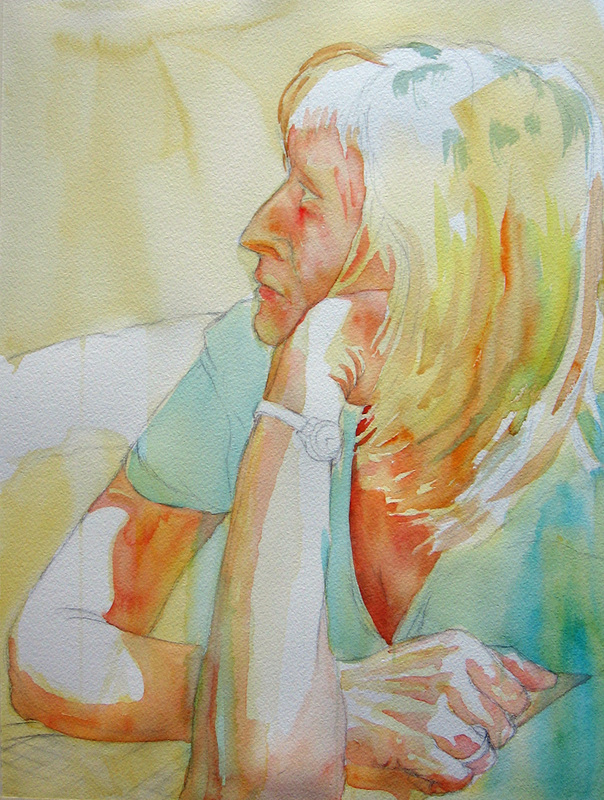 I am teaching a watercolor portrait class this session. 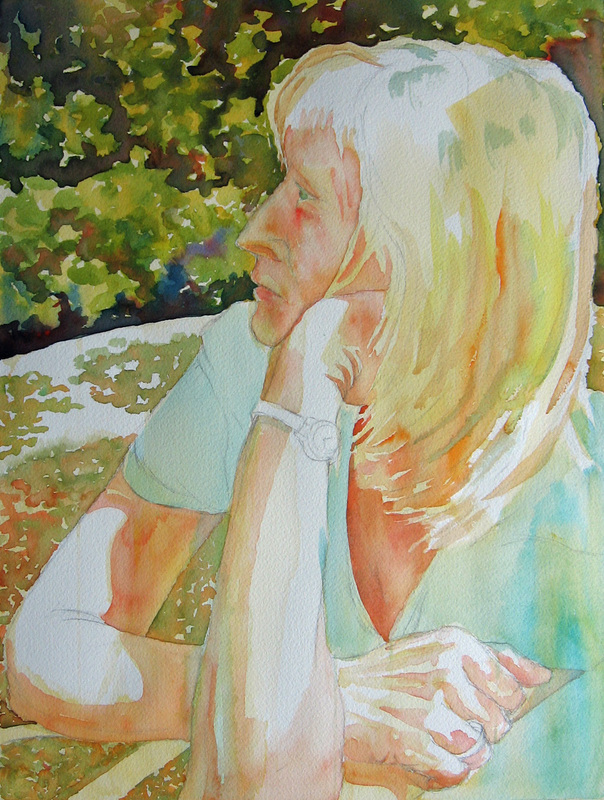 I have not limited the subject matter to painting people, alone. We try to discover shape and value and line and color in relationship to what suits our desire for personal expression through portraiture of people and/or animals. 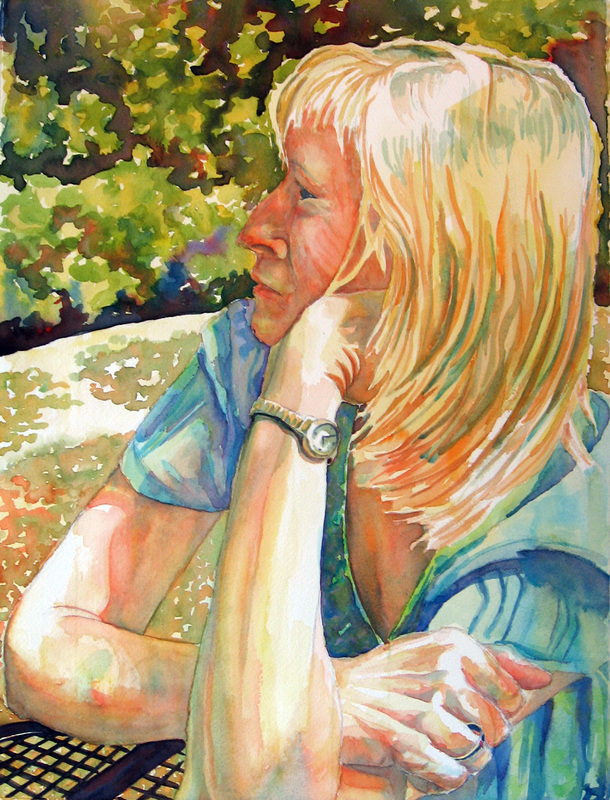 The above portrait was painted from a pure desire to reach in and paint how I wanted to depict the image from all that I have learned on my journey with watercolor. 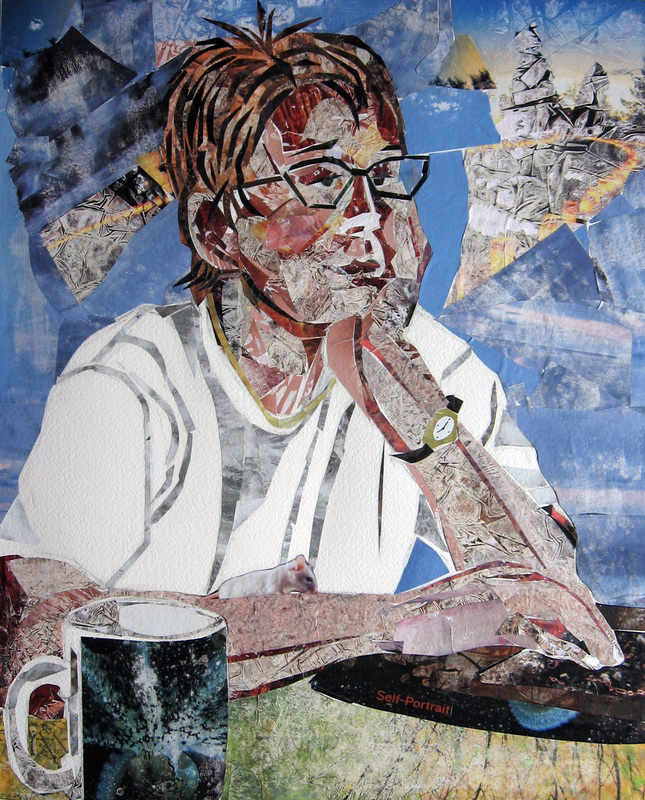 This portrait is of a friend of mine who agreed to allow me to photograph her for this painting. I thank her for this opportunity. I drew the portrait with a simple line drawing. I paid particular attention to the foreshortening of the forearms. I used the acrylic crosshairs, mentioned in the previous post, to see this better. I then placed my board and painting on an easel at about 45 degrees and painted large washes over the entire painting and carved out the light, creating a pathway. 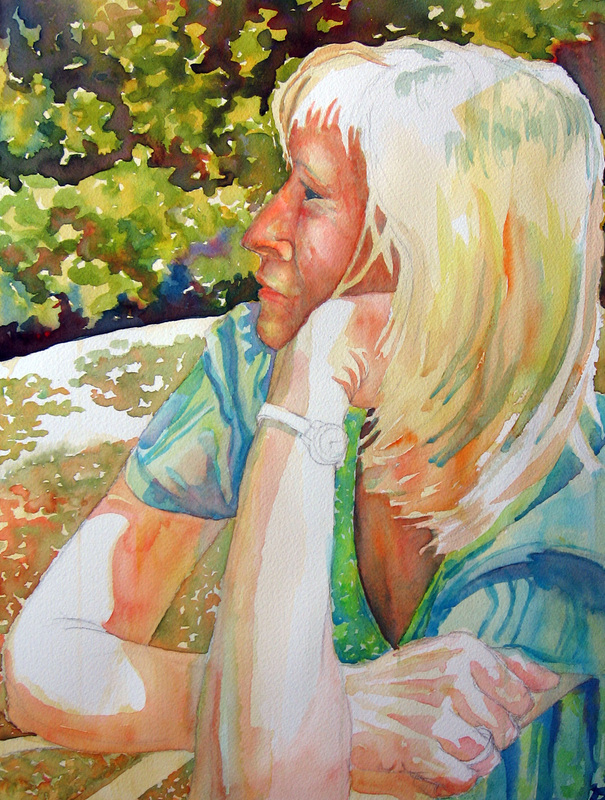 In this step, I worked on painting skin tones using combinations of reds and yellows. I don’t think I was as concerned about the actual color of the skin as I was with working out some of the values and carving into the large white shapes I had left like the fingers on the hand in the foreground, the tone of the chest area, the shadowed face and the shadows around the upper and lower right arm. I began to play with applying colors for her hair. This step was the most informative for me. 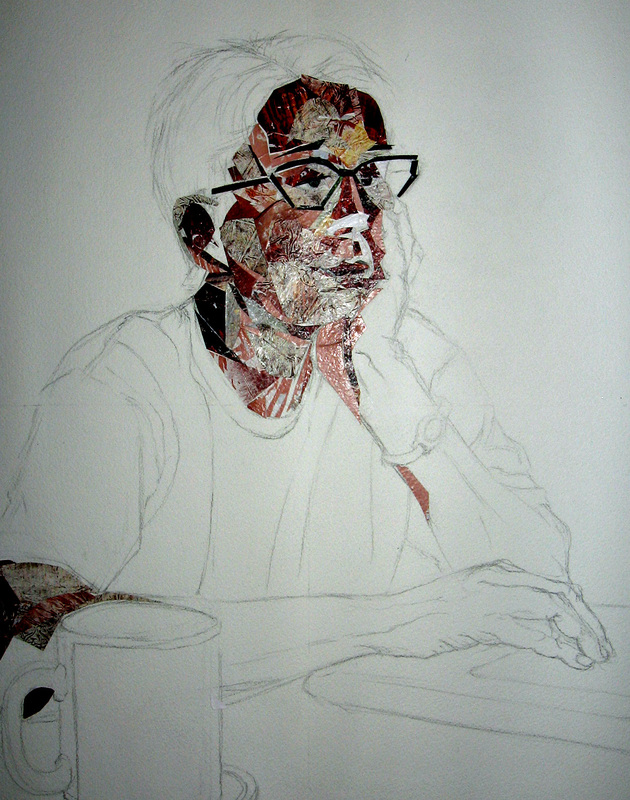 I think that is because the background helps me to set the tone of the foreground figure. I always try to paint the background in the middle of rendering the portrait because it affects the overall outcome. If I wait too long and finish the portrait, first, I get frustrated with the changes that the background creates with the figure. In otherwords, what I am looking for is to tie my background to the foreground. I always use colors from a background in the foreground. This makes this stage rather lengthy and I often experiment with color mixes on a scrap sheet of the same watercolor paper I’ve chosen for the portrait. I knew I wanted this to look like august and used some oranges and yellows to create my greens. I also used mixtures of red and blue to create the darks in the trees. This step was fun in that I had a specific challenge to get her face dark enough to appear in shadow. I had to capture a subtle highlight in tiny areas like the brow over the eye, a spot on cheek, upper lip and chin. I started by laying in light shadow washes of blue. That didn’t go so well but helped me to visualise the highlights. I had to soften these blue washes by dabbing at them with a crumpled kleenex until I had them the way I wanted them. I had lost some of the rosey look of her nose and cheek and lips so I brought that back with a mixture of reds and yellows. Next to the damp rosey washes I painted in light washes of yellows and dabbed at them with a kleenex. It felt as though I was painting with my brush and shaping with my hand. I do this often in a painting. The other shapes I worked on was to define the blouse. I shadowed the wrinkles. I paid careful attention to the right sleeve that pressed against her skin. That shadow was very warm so I used some red and yellow there. I furthur described her hair, attempting to get the large shadow shapes. In the final stage, I needed to tie everything together. It is often a time when I can capture subtle detail and add some more of my individual expression. The detail came in the form of painting the ring and the watch and defining some of the strands of her hair in the shadowed area. 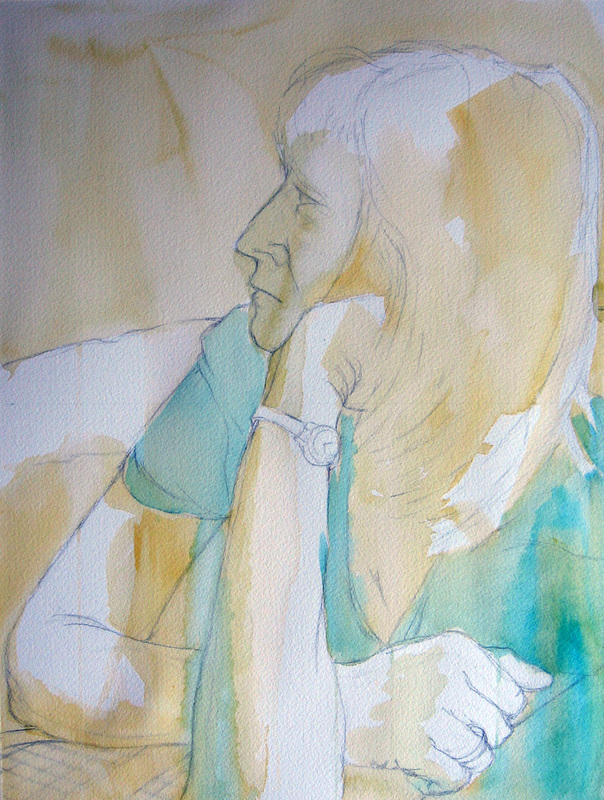 I deepened the shadows on her forearms and hand so they read well with the rest of her. I also included wet splashes of blue on her forearms and the top of her head to indicate some of the flickering shadows from leaves that played on her form. I used the reds and blues from the trees to paint in the tabletop. The entire painting was painted on an easel set at a 45 degree angle.